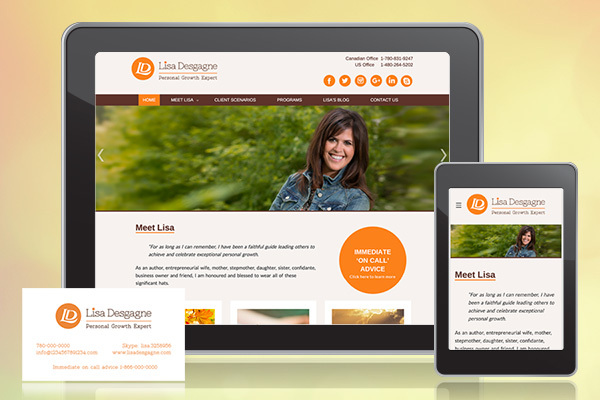 NDDesign was honoured to work with Lisa Desgagne – Personal Growth Expert, and Jan Eden – Lisa’s Business Coach and Mentor, on this full marketing package. With Lisa’s goals and Jan’s direction and vision, we were able to graphically create Lisa’s branding, business cards, website presence, online newsletter, and book cover. We then provided the consultation to publish the book and make it available on Amazon. For her logo, Lisa knew that she wanted her initials to make up the logo symbol. She also had a specific colour scheme in mind. Once we received an idea of the style she was looking for, we provided many examples. We were then able to narrow it down to one logo which we adjusted to her satisfaction. For many companies, it is not enough to have only a graphic designer or only a business coach. In many cases, it is beneficial to have both a corporate / professional growth expert AND a creative expert, to bring the whole package together and really reach out to your ideal client. Jan Eden and NDDesign have worked together with many clients in the areas of branding, marketing strategies both online and offline, and developing a niche in the marketplace. We have a synergy with each other and with our clients to help them reach their business and personal goals. Contact us for more information! “I have worked with Heather from New Dimension Design for over a year to this date. She has helped me in every area of setting up my Personal Growth Consulting business , from designing my logo, my business cards, custom designing my website and helping me with self publishing. During my time that I worked closely with her, I wrote a book and Heather helped me with design and layout of the book as well as guiding me to self publish to make available on Amazon.